During a backup, SQL Server creates one reader thread for each volume that the database files reside on. The reader thread simply reads the contents of the files. Each time that it reads a portion of the file, it stores them in a buffer. There are multiple buffers in use, so the reader thread will keep on reading as long as there are free buffers to write to. SQL Server also creates one writer thread for each backup device to write the contents of the buffers out to disk or tape. The writer thread writes the data from the buffer to the disk or tape. 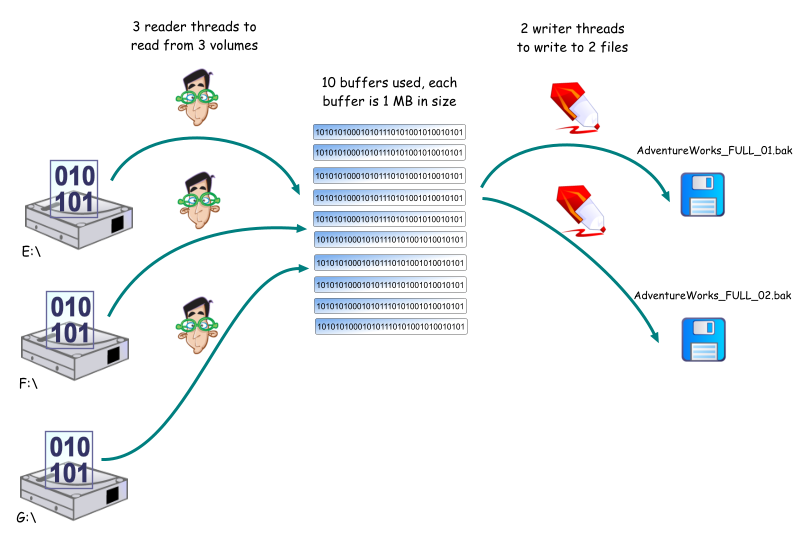 Once the data has been written, the buffer can be reused by the reader thread. SQL Server does not distinguish between logical and physical volumes. In the above example, if E:\, F:\ and G:\ are all partitions on the same physical drive, 3 reader threads are still used to read the data files. If your disk cannot keep up with the read demands, the backup throughput will be adversely affected. If you want to find out the size and quantity of the buffers used by SQL Server for a backup, you can turn on trace flags 3605 and 3213. The values used are then recorded in the SQL Server log e.g. Acknowledgement: Some icons on this page were generously provided by Fasticon.com. 7/31/2008 Added note on logical volumes. 7/14/2008 Added details on trace flags 3605 and 3213.